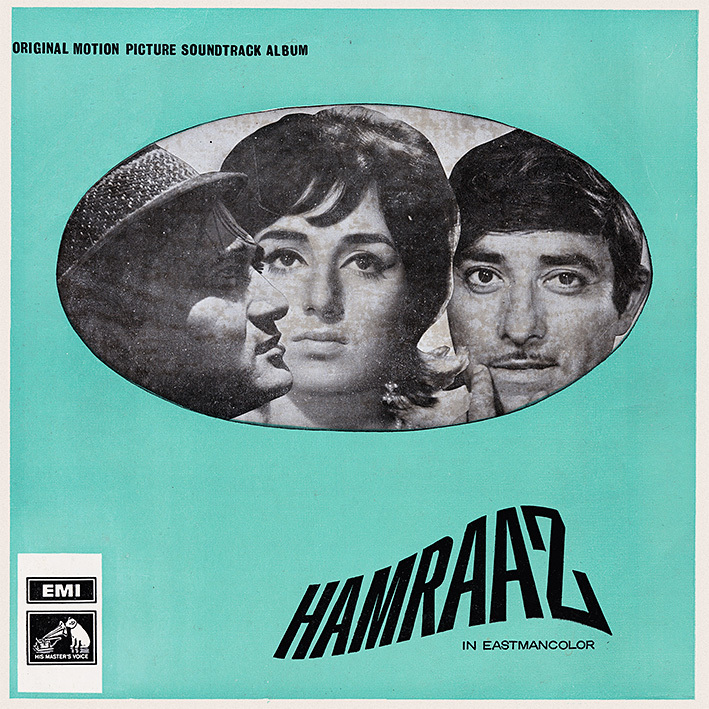 Despite 'Hamraaz' being a fairly recent acquisition, I've known about the soundtrack for years due to being struck by its artwork. The smart simplicity of it, the look of the cover stars and the typography really appealed to me, yet Ravi was an MD who initially didn't interest me much, therefore I kept passing on it. His music has grown on me a lot since then though (two of his scores were included in the MFT3F book), so it was only a matter of time before I succumbed. Do I like it? Yes, quite a bit. It might not feature among my favourites but it does contain a couple of really nice songs. The gently swaying 'Neele Gagan Ke Tale' is a highlight, along with the elegantly rousing 'Tum Agar Saath Dene Ka Vada Karo'. Both have lovely melodies, both are distinctly hummable. 'Kisi Pathar Ki Murat Se' is rather good too; stylish and understated (I love the short piano interludes). And there's a compelling 'Title Music' with an exotic, almost mysterious feel; very becoming what I think is a suspense movie. amazing! been waiting for this one a long time, thanks so much. Wow, those versions are both - each in their own way - pretty amazing! Thanks for pointing them out. Thanks for sharing, this album has some very melodious songs & the film is pretty good too.